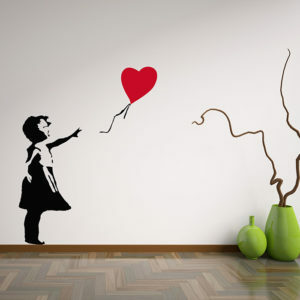 We are ‘keeping it street’ by offering a massive collection of Banksy Wall Stickers and decals, we have more than 30 great designs to choose from with more on the way. These street art designs by the UK graffiti artist are uber cool and look great on almost any wall space in a modern home. Choose from the infamous Banksy Rat designs or his iconic ‘Apes will Rise’, The Mona Lisa Arms dealer, ‘Take out’ / Caveman, boy meets girl, pat down and Banksy Panda through to some of his more recent street art such as the Banksy Maid ‘Keeping it clean’ which recently made the news for the amount of money it made when sold at auction. Wall Stickers are a great way to add some vitality to a room as they are affordable art options, they can be moved, transferred to new rooms and walls, they can be cleaned and will stick to almost any non porous surface. 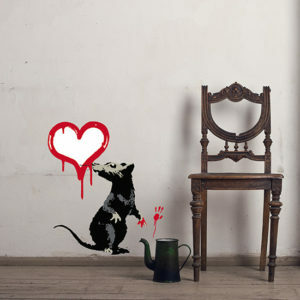 Browse our full range of Banksy Wall Decals here. Don’t forget our ‘Wow Wall Decals promise’, if you have seen something you like elsewhere and would like to buy it, always feel free to contact us and let us know as its highly likely that we can reproduce or source the design you like.